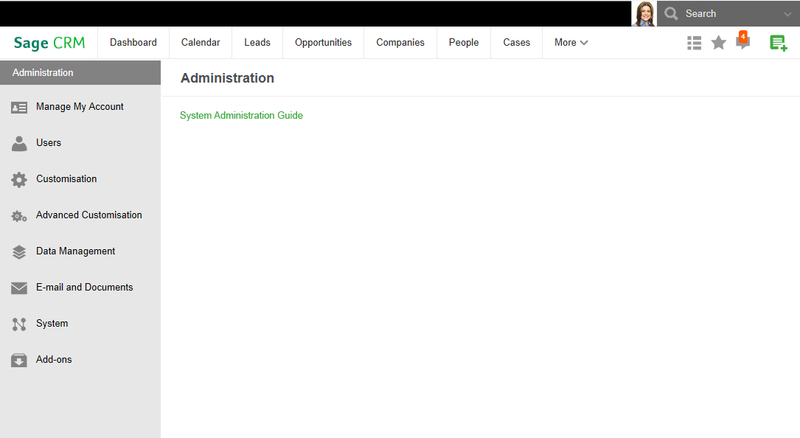 Download "Sage CRM 2014 R2 Welcome to your new Sage CRM experience"
4 Image to go here What s new? Improved navigation brings many new enhancements to the user interface. A new Main menu, including a new Quick Access toolbar, makes navigating through your information much more intuitive and easier than before. This new navigation is home to your key CRM information such as Opportunities, Companies, Leads, People, Calendar, Cases and more. The menu contents change depending on whether you have chosen My CRM or Team CRM mode from the profile drop-down. Brand new areas enable you to search for your information, access your notifications and recent records, and easily create and access a list of your favourite records. Keyword Search Searching your CRM database can become a challenge as your list of prospects and customers grows. A new Keyword Search feature lets you perform a quick search across any of the main CRM entities (Company, Person, Opportunity, Lead, and Case) by simply typing key terms in the search field. This helps you locate a record even if you don t remember the full name. The new search area also contains advanced search and logical search functions that enable you to carry out more complex searches within. Quick Access toolbar The Quick Access toolbar is a new area for fast access to important information including: Recent list a list of your recently accessed records. Favourites a list of records marked as favourites with the star icon. Notifications a list of reminders for important tasks and appointments. The information above is displayed in a right menu, launched by clicking the relevant icon on the Quick Access toolbar. Adding new information Adding information in is a much simpler and efficient process. Wherever you are within, all you need to do is click the New button to add anything from a new lead or a new order to a new customer communication. Responsive UI* In, the new navigation and your new custom modules will respond to the tablet or smartphone device on which you are working, enabling you to access your important information when and where you need it. This enables a seamless and consistent experience across every mobile device. *Please note: Core entities, such as Companies and People, will still have areas that will not respond to the native device and will have screen elements that display off screen. 6 A fresh new look Eurolandia Dashboard Calendar Leads Opportunities Companies People Cases More Companies New buttons New icons New tab style New coaching captions Colour coded messages New style weblinks New cleaner font style New interface The new look and feel of delivers an enhanced new interface with a cleaner navigation menu, a new icon set, new fonts and headers, new colours and styles, and a brand new pipeline for leads, opportunities, and cases. 7 A fresh new look Dashboard Calendar Leads Opportunities Companies People Cases More Dashboard New Sales Dashboards Two new pre-installed sales dashboards are available out-of-the-box for Sales Directors and Sales Managers. 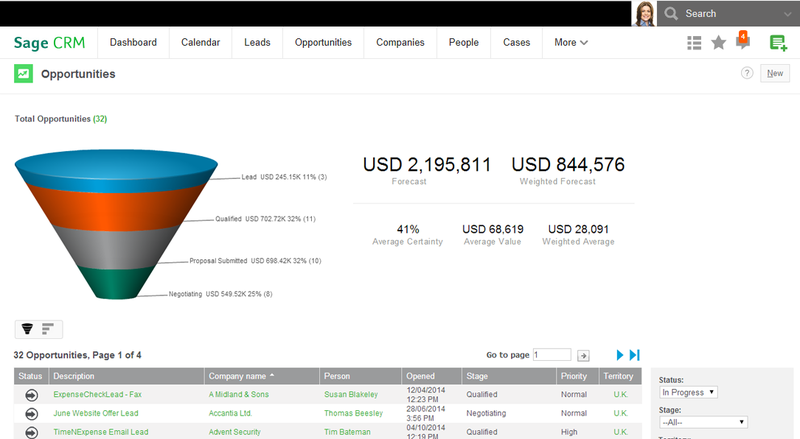 This gives Sales Directors and Managers an at a glance snapshot of key business metrics with visual graphs for quick analysis. 8 A fresh new look Dashboard Calendar Leads Opportunities Companies People Cases More Opportunities Total Opportunities (32) Lead EUR K 11% (3) EUR 2,195,811 Forecast EUR 844,576 Weighted Forecast Qualified EUR K 32% (11) Proposal Submitted EUR K 32% (10) 41% Average Certainty EUR 68,619 EUR 28,091 Average Value Weighted Average Negotiating EUR K 25% (8) New look sales funnel Gain a quick snapshot of all opportunities with the new look sales funnel. 9 A fresh new look Dashboard Calendar Leads Opportunities Companies People Cases More Cases 1 Logged 0 Queued 2 Investigating 1 Waiting 0 Solved 0 Confirmed New look cases pipeline Easily monitor customer cases with the new look cases pipeline. 12 Getting started Dashboard Calendar Leads Opportunities Companies People Cases More Getting Started Icon Bar Welcome Customising screens Setting up new users Welcome! Browse the Getting Started page to learn how to get the most out of. The page links to Help topics and video tutorials for specific tasks. You can return to this page at any time from the Main menu Use these icons to open lists of: Recently visited records Favourite records Notifications? dition Edition Creating leads and opportunities Uploading data Managing dashboards UI and navigation tour A quick two-minute tour is available to bring you through the new navigation experience and to guide you through the key areas of the new UI. 14 New Main menu Dashboard Calendar Leads Opportunities Companies People C 23 Communications Profile drop-down Several options that used to be found on the Main menu are now housed in a Profile drop-down area the My CRM/Team CRM switcher, the Logout option and, for Administrator users, the Administration link. The Preferences option from My CRM has also been moved into this Profile drop-down, and a new option here is the ability to upload a profile image allowing you to personalise your experience. 15 New Main menu Dashboard Calendar Leads Opportunities Companies People Cases More 23 Communications Advanced search A new search area enables you to find your information quickly and easily. This new search area contains three types of search. The Keyword Search box at the top-right of the screen, and a search drop-down containing Advanced Search and Logical Search options. These three search options are covered in more detail in section 05, Finding Information. 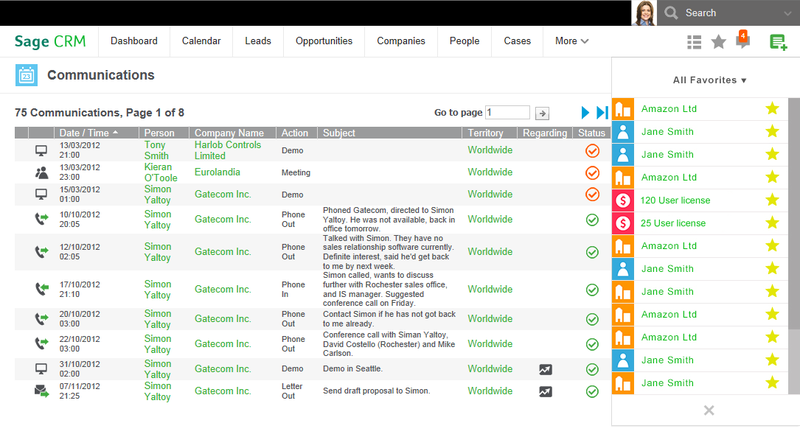 16 New Main menu Dashboard Calendar Leads Opportunities Companies People Cases More 23 Communications My CRM When working in My CRM mode, the My CRM menu tabs will be persistent throughout the system, giving you easy access to the lists of records that are assigned to you. 17 New Main menu Dashboard Calendar Leads Opportunities Companies People Cases More 23 Communications Team CRM mode When working in Team CRM mode, the Team CRM menu tabs will be persistent throughout the system, giving you easy access to the lists of records that are assigned to your team. The profile image will switch to a Team CRM image when you are working in Team CRM mode. 18 New Main menu Dashboard Calendar Leads Opportunities Companies People Cases 23 Communications More drop-down A new More drop-down menu can be found on the navigation bar. Options such as Reports and Marketing are now housed here. This displays in both My CRM and Team CRM mode. 19 New Main menu Dashboard Calendar Leads Opportunities Companies People Cases More 23 Communications Companies list and People list A new addition to the My CRM and Team CRM menus is a list of the Companies and People assigned to the logged in user or team. 20 New Main menu Dashboard Calendar Leads Opportunities Companies People Cases More 23 Communications New drop-down menu A New drop-down menu has been created which makes adding a new record in much simpler. Clicking the New button launches a drop-down menu that allows you to create new entity records and new communications items regardless of what screen you re in. Any custom modules created with Builder are added automatically to this menu. 22 Quick Access toolbar Dashboard Calendar Leads Opportunities Companies People Cases More 23 Communications Quick Access toolbar The Quick Access toolbar is a new area for fast access to your important information. It houses icons for the Recent list, moved from the old Main Menu, a newly introduced Favourites list, and your list of notifications. 25 Finding information Dashboard Calendar Leads Opportunities Companies People Cases More 23 Communications Improved search functionality A new Search area in helps to improve the search experience for customers. You can now quickly and easily find the relevant information you need with 3 types of search options. 1. Keyword Search Keyword Search allows you to perform a search across all text fields on any entities. 2. Advanced Search Advanced Search allows you to search on a per entity basis, combining any number of criteria on the Search screen. 3. Logical Search Logical Search allows you to perform more complex searches using SQL. Any custom modules created with Builder are added automatically to this menu. 26 Finding information Dashboard Calendar Leads Opportunities Companies People Cases More 23 Communications Find information quickly and easily Other places that you can quickly and easily find information are the: Recent list, which will display a list of recently accessed records Favourites list, which will display a list of any favourited records. 28 Adding information Dashboard Calendar Leads Opportunities Companies People Cases More 23 Communications Create new record or communication Adding information in is a simple and quick process. Wherever you are in the system, you can click the New button to create either a new record or a new communication item. Any custom modules created with Builder are added automatically to this menu. 30 Working with information Dashboard Calendar Leads Opportunities Companies People Cases More Eurolandia Companies Action buttons When working with your customer data in, the action buttons that used to be located on the right-hand side of the screen, e.g. Summary Report, are now located at the top right of the screen. Any workflow buttons are also located in this area, consolidated into a single drop-down button called Actions. 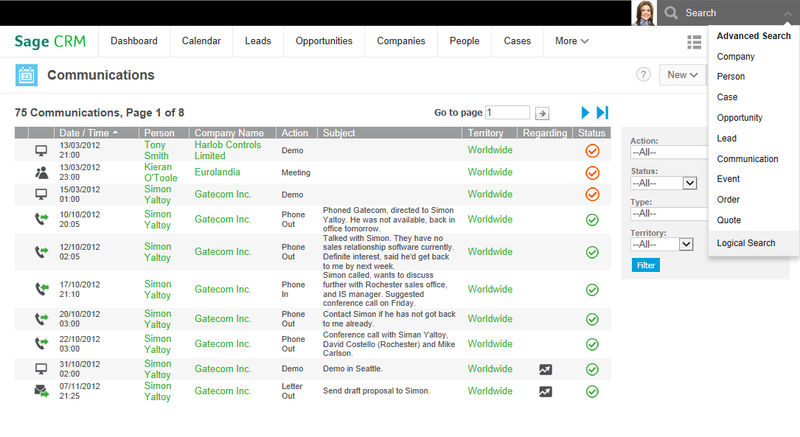 32 Contextual information Calendar Leads Opportunities Companies People Cases More Companies Adding information in context Adding information in context is also straightforward - simply click the New action button when working with your customer records. For example, when in the My CRM Companies tab, clicking New will bring you to the screen on which you can enter a new company. 33 Contextual information Dashboard Calendar Leads Opportunities Companies People Cases More Eurolandia Companies Context information Context information that used to be located at the top of the screen is now directly above the information to which it relates. 35 Administration Dashboard Calendar Leads Opportunities Companies People Cases More Administration left menu has made it easier for administrator users to navigate around the Administration area by introducing a flat, persistent left menu. 37 Responsive navigation Responsive navigation offers new responsive features, meaning it will adjust to whatever mobile device you are using. The My CRM/Team CRM menu will collapse into a mobile menu and on smaller screens, page elements like buttons and charts will collapse. 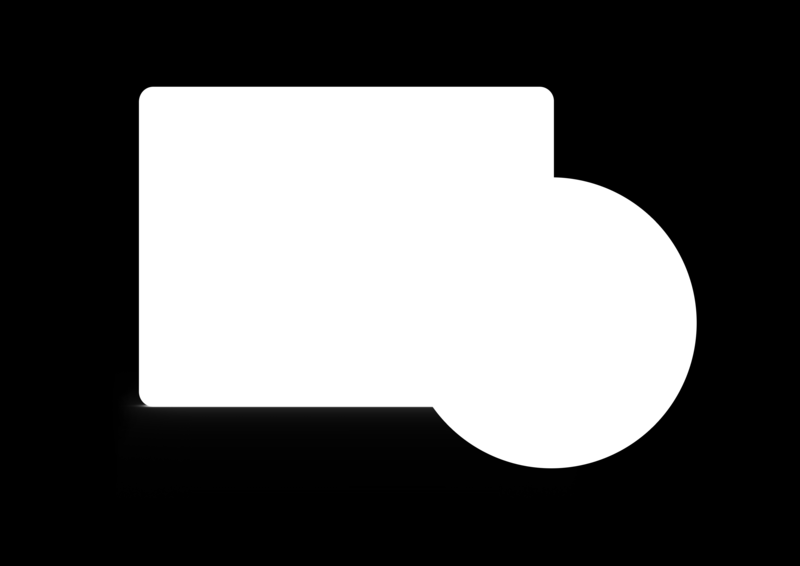 Any new modules created with Builder will also respond to your mobile device. 38 Over 15,000 small and medium sized companies across the globe use every day to accelerate sales, drive business productivity and make every customer interaction count. It is used by enterprising, growing companies seeking new ways to interact with customers, leverage the power of social media and take advantage of the latest mobile developments to further grow their business. When combined with Sage ERP, our customers enjoy better business insight, increased efficiencies and productivity, and gain a single, customer-centric view across their entire business. So whether you re just starting out or have already grown to several hundred employees, can help accelerate your business success. Accelerate your business success with a free 30-day trial at C 2015 Sage Group Plc. March 2013 7.2 Release Preview Overview The release of 7.2 delivers a host of exciting new features and enhancements that help you leverage the latest trends in mobility, Social CRM, and business collaboration. CRM. Know your business. Grow your business. CRM Know your business. Grow your business. Welcome to Sage CRM Sage CRM is an affordable, adaptable and easy to use CRM solution designed with the needs of small and medium sized companies at its core. Targeted measurable marketing Plan, execute and measure your campaigns An invaluable tool for marketers, enables your marketing teams to plan, execute, and measure the success of every marketing campaign. Data Entry Training Module Estimated Training Time: 1 Hours Data entry training is for users that are planning on entering data into the InsightVision application on scorecards that have already been created. Pebble+: Ability. Use for: Recording your activities. What s the output? Where do I find it? Want to give it a go? What do I do with it? 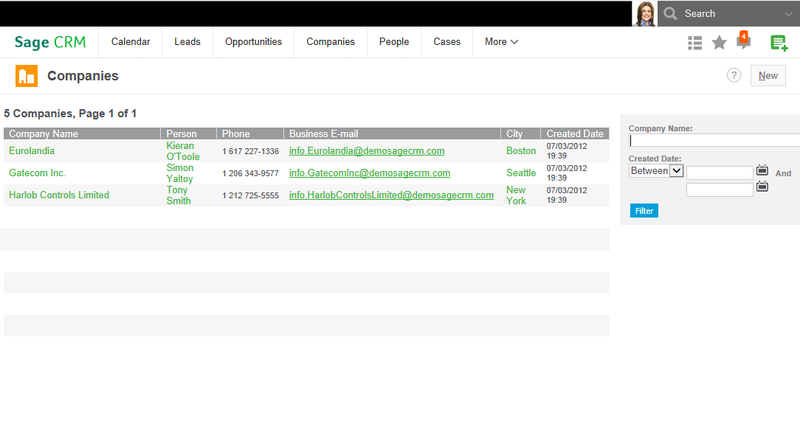 Sage CRM 7.2 Enhancing productivity. Enabling success. Base CRM Guide. Getting started and understanding of the basic features of Base CRM. Your complete guide to installing the info@hand Self-Service Portal and estore.